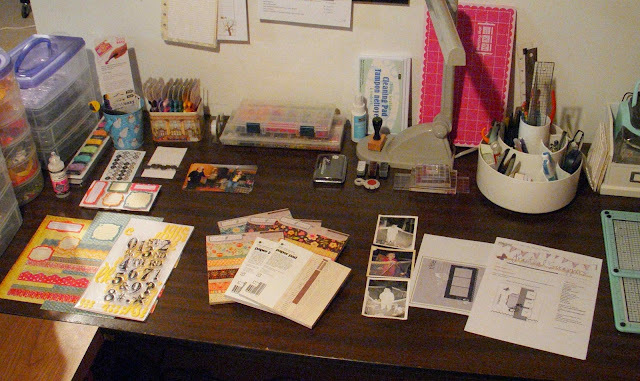 Today you're catching me between projects, so there's odds and ends spread out all over my desk. On the left is what remains of my Counterfeit Kit. I made some cards last weekend which I hope to post soon. In the middle are 6x6 paper pads from My Mind's Eye and Basic Grey. I'm getting hooked on these. Not only are they great for card making, but the smaller scale is perfect for cutting titles and embellishment with my Slice. I needed a small piece of patterned paper for a layout and was able to use the paper pad instead of cutting into a 12x12 piece. Any one else have tips for using these handy little paper pads? And on the right are the beginnings of my next scrapbook layout. Photos and a few sketch ideas. Hoping to get started on this later today. Great desk. It makes me want to pull up a chair and play! I like using the small pads of paper in collage. They add a great look and a wash of gesso can turn lots of disparate papers into a nice group. So orderly, once again! Love the 6x6 pads for...just about everything! Extra-nice when you want one of everything in a collection, don't you think? i too love the 6x6 pads! Wow, your work desk is always so neat! Can't wait to see those cards you made!!! Yes, the smaller scale patterns on the little pads are great. Those Echo Park papers I was using have four small patterns on the reverse side of some of the papers which is a neat idea. A Slice? I'm thinking of getting one of those. Nice and tidy desk Sue. I always buy the smaller pads as I made cards only and large patterns really swamp the design at times, BG stuff is great. I used a pack of 6x6 cardstock from Coredinations for a mini-album and it was so simple because they were already the same size. Can't wait to see the layout with those cute playpen photos. Wow, you keep a clean desk! WOW TIDY DESK - You are so organised ! i love those papers too! I feel I should go tidy up - you put me to shame! Oh so much to love here. I would love to come play! Now that's a tidy work area... Looks so inviting to have FUN! That desk is entirely too neat :-) 6x6 trimmed down just a tad on one side is the perfect size to line an envelope if you have a piece leftover. I also use mine for the Cricut. Small scale patterns are just right for cutting up. Oh, I love the new My Mind's Eye lines! You were smart to buy them up because most places sold out quickly! Hope you got a lot done today! I love the pads, and have to stop myself buying them. That's not a tip is it..but you know what I mean! Your desk holds a lot of threads (very pretty too) - how's the old sew it thingy going? After getting some freebie My Minds Eyes I'm gettting hooked on them too, they are lovely papers/ Your desk is sooo tidy! Unlike mine!! Even when you're working you desk is still organized. How do you do it? Mine looks like a tornado everytime I am in there, even when I am doing something fast or tiny. I'm with you, Tracy. When I am working, my whole room looks as if a bomb has hit it. Even though I am doing a parchment card at the moment, my desk is still littered with tools and things I might need to use. I need lessons from you, Sue, on how to work tidily.